Leaves absent or basal and 1 per shoot, convolute. Inflorescence racemose, 1–many-flowered, terminal; flowers resupinate. Dorsal sepal free, broad and concave, often forming a loose, horizontal 'cap' over the column. Lateral sepals free, similar to, but usually narrower than dorsal sepal. Lateral petals free, shorter and narrower than sepals. 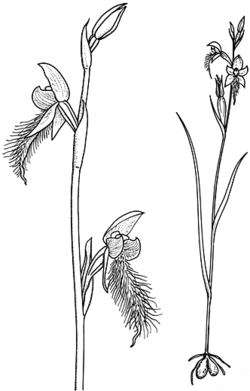 Labellum free, attached at base of column; lamina not lobed, narrowing to an acute or elongated, crisped tip, in most species decorated with a dense 'beard' of fine, metallically lustrous, elongated calli often grading towards shorter, central calli, or rarely smooth, basally bearing continuous polished plates or knobby warts. Column lacking free filament and style, stubby; column wings fused to (and surrounding) column, forming a mitra; dorsal part of mitra greatly reduced, poorly pigmented, papillose and clasping the anther; the expanded, basal section in front of the stigma usually forms two rounded collars flanking the stigma, each usually ornamented with a dark, shiny gland ('sham eye'). Column foot absent. Anther erect, parallel to the axis of the column, persistent. Pollinia 2, soft and mealy. Stigma entire. Rostellum ventral. Distribution and occurrence: World: 12 species, Australia, New Zealand, New Caledonia, New Guinea. Australia: 11 species (8 species endemic), all States.